Attention Members: Please login to the membership area for more details. Streeter Galloping Goose Parade June 11th, 2016. Ranch Rodeo** - July 7th, 2018, 4:00 pm Registration. **Note: CANCELLED - Due to equine herpes virus, this event will be rescheduled based on signup interest and/or state recommendations. Ranch Rodeo - Sunday, Sept. 16th, 2018. Time 3:00 pm - Dusty Trail Riders Arena, SW corner of Streeter, ND - Click Here to download Event Flyer - Contact Us for more information. Please check our Facebook page for any new announcements. 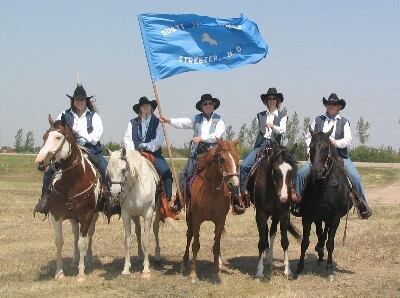 Streeter Parade - July 8th 11 am - Contact Us for more information. 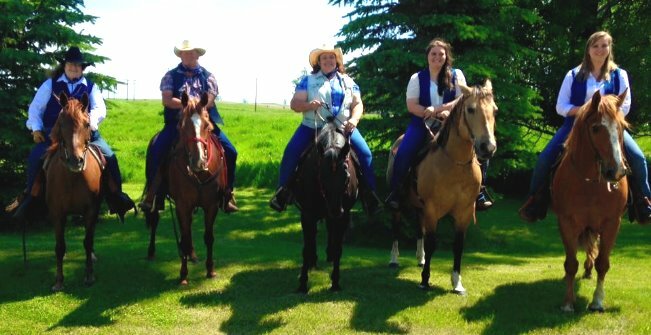 Ranch Rodeo - July 8th 5:30 pm - Dusty Trail Riders Arena, SW corner of Streeter, ND - Contact Us for more information. Thank You! To all those who helped to make this event possible! July 9th or 23rd for a Pig Roast at Dusty Trail Riders’ Club Area. 2016 Officers: Curt Kaiser-Pres., Blane Naze-V. Pres., Mary Ann Kaiser-Sec./Treas. Saturday May 5, 2017 Work, Meeting, and Pot Luck - Voluneeters needed, the more the merrier! Meet at the Club House, Streeter, ND. 1:00 pm. Need work: Painting out houses, repairing roof on one out house, trimming some trees and picking up down branches (which are only 1 or 2 from the snow) and some left over hay, also some cleaning up inside club house. We will have a meeting either before the potluck or after to report on what was decided at todays meeting and a couple reports from other individuals' that are finding out prices on things. Also we need ideas for dates for some riding/camping; where & when needs to be talked about. After the Work/Cleanup/Meeting we will have Potluck: Hamburger will be donated and Curt will bring his grill in and we can make hamburgers and the salads and deserts are up to the rest of us. If you would like a different meat please bring your own and bring your own drinks for the day. Please RSVP to Lacey Kaiser on Face Book or , or call 701-424-3744 to say you will be there! This will help us know how much hamburger to bring. Thanks! Thank You to those who attended our General Meeting: Held April 30th, 2017 1 pm at The Club House, Streeter, ND. During which a schedule of possible events were planned for 2017. We will be allowing the NWHR to use our arena for drill team practices during 2017. Plans were also made to work on cleanup and repairs for arena and club house. Please check back later for update to these postings, or check in on our Facebook page. Please if you have questions, about our next event or if you would like to join us.